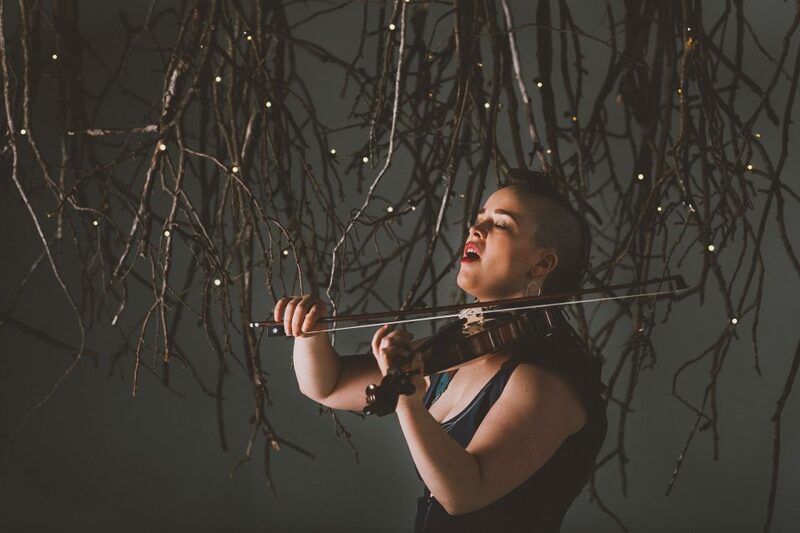 You are a singer and violinist based in Winnipeg, Manitoba. Is that where you started out? I got my start in Winnipeg, yes. It is a musical and welcoming place for artists. I’m lucky this is my home. It is also flat, and that has done a lot to shape my understanding of physics. What genre would you say your work fits into best? I think my personality is most reflected in my live show. The songs themselves, sometimes they feel like they come through me – like I am the steward of the song. So, although my songs are often deeply personal, they also feel other-worldly, universal. Where my personality really comes through is in my stage presence, storytelling, and joke-cracking on stage. On stage I feel authentically myself. It is a great feeling. .
I’m making a second record right now! It is the best. It is a Manitoba-made recording with Lloyd Peterson producing and engineering. There are lots of strings, lots of sounds, and lots of words. I am excited. . The Internet allows me to connect to people all over the world, to stay in touch with fans and friends, and to share my art far and wide. Awesome. Downside: the cultural shift away from paying for art. I’m of the camp that if we want things to keep existing, we should really pay for those things when we can. Because that’s just how capitalism works. What/who do you listen to? I’m a dyed-in-the-wool folkie. I mostly listen to singer-songwriter type things with words. Words are important to me. But I also have a classical music background, and I can get behind instrumental music. Mozart is my favourite. That guy was tapped right in. I care about making the world a safe and joyful place for all beings. On a large scale, redistribution of power and restitution to oppressed groups is key. On a small scale, I think connecting compassionately with people far and wide is a good place to start. If the whole city or province or country or world was made up of tight-knit, inclusive communities, I think that would make for a more compassionate, fairer, kinder world. Has there ever been a moment you’ve experienced that altered the path of your life? Two teddy bears my sister and I have had for 23 years. Really, those guys are it. Instruments are way up there, too, but just nothing compares to the teds. Writing happens all over. Notebooks and phone files full of cool bits. A lot of the assembling and organizing happens right here, where I am now: at my tiny dining room table, in my studio apartment in Winnipeg, in the company of my many plants, and an always-full cup of tea. How is your music most often described? I’ll tell you my favourite description a recent fan gave. “It’s like she’s singing things that I feel. She sings feelings. She is a wizard.” I get compared to Joni Mitchell a lot. We have a similar vocal type.